Thieves Vitality Essential Oil Dietary & Culinary Delight! Healthy Dietary & Culinary Delight! Thieves Vitality Essential Oil maybe used as a dietary supplement to support healthy immune system* and overall wellness goals* when used internally. Just add 1–2 drops to a vegetarian gel capsule and take daily or as needed as a dietary supplement! Or add to your favorite beverage! I love adding to Chai Tea Latte! Did you know that Thieves oil was developed based on the ingredients found in the "Four Thieves Vinegar" or "Marseilles Vinegar"? The vinegar was first prepared by thieves that worked in the spice industry and robbed graves to generate income in the 15th century. Thieves Vitality essential oil is definitely one of my favorite essential oil blends and I will not leave home without it! 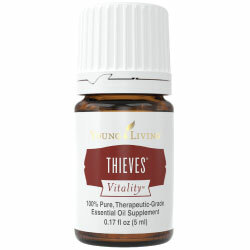 A day doesn't go by that I don't use Thieves Vitality or Thieves Oil for something! The key ingredients listed below combine perfectly to offer a key benefit of Thieves Vitality oil: support of a healthy immune system and overall wellness! Eucalyptus Radiata Vitality may also help support a healthy respiratory system when taken internally*. This is an easy reference guide for Thieves Vitality Essential Oil Blend. It will tell you how to use your oil blend and what to use it for. It will also provide you with some fun tips and testimonials! Want to Purchase Therapeutic Thieves Vitality Essential Oil? Go to the Oil Shop! Buy Thieves Vitality Oil Here! What is in Thieves Vitality Essential Oil? There are five different essential oils in Thieves Vitality. They are listed below along with a brief description of each oil. Clove Vitality Essential Oil (Syzygium aromaticum) promotes a healthy immune response, and may support overall wellness. * An important ingredient in Young Living's Thieves blend, its principal constituent is eugenol. Lemon Vitality Essential Oil (Citrus limon) Lemon consists of 68 percent d-limonene, a powerful antioxidant. It has cleansing and purifying properties. Jean Valnet MD estimated that it takes 3,000 lemons to produce one kilo of oil! Eucalyptus Vitality Essential Oil (Eucalyptus radiata) may support a healthy respiratory system*. Rosemary Vitality Essential Oil (Rosmarinus officinalis CT cineol) was one of the most broadly used plants throughout the ages. Supports a healthy lifestyle regimen and overall well-being*. This oil provides a savory addition to many meats marinades, side dishes, and dressings. Rosemary includes the naturally occurring constituents eucalyptol and alpha-pinene. What are the Documented Uses for Thieves Vitality Essential Oil? Healthy immune system and overall wellness*. Want to Learn about Thieves Vitality's Emotional, Spiritual and Other Uses? Then go to the Thieves Oil page! Dietary Supplement: place several drops in capsule with olive oil and take internally. (20:80 dilution-one part essential oil: one part vegetable oil). Add a drop or two to water, juice, NingXia Red or other beverage. Place in favorite baking or sauce recipe. Place 1 drop on tongue and put against the top of the mouth. Apply to gums. A supplement called Inner Defense contains Thieves plus Oregano and Thyme Essential Oils. The oils are loaded with antioxidants. I take one every day to help support my immune system. Or check out Thieves Essential Oil Natural Cough Drops for sore throats and cough! Can this oil be used for Animals? Yes. Always start slow. With a small dog or cat use a toothpick amount to start. (Dip toothpick in bottle to get that amount). Horses and ponies can tolerate more because of weight. What are the Safety Precautions? Children under 18 months of age should not use this oil. Women who are pregnant should use caution. If pregnant or under a doctor's care, consult your physician. Add a drop to granola, oatmeal or other breakfast cereal to start your day with a spicy zing!